This year&apos;s festival, held on September 21st, was themed "Women of the Blues" as each band featured regionally and internationally-known female lead singers and guitarists. Connie Hawkins and the Blues Wreckers kicked the day off at 11:00 am and by the time I arrived at noon, lawn chairs set up on the streets backed up at least a block in three directions from the stage at the intersection of Main Street and Newbury Avenue. Additional festival attendees continuously streamed in throughout the day with lawn chairs and coolers in tow. Despite a pleasant late September temperature, a harsh sun beat down and things heated up as The J-Love Band hit the stage. Visitors tried to cool off in any shade they could find while the veteran festival attendees set up tailgate tents and canopies. In between sets, many beat the heat perusing the impressive antique stores located downtown. Others sampled wine flights at the Prairie Fire Winery Tasting Room, right on the corner of Main and Newbury in the middle of the action. 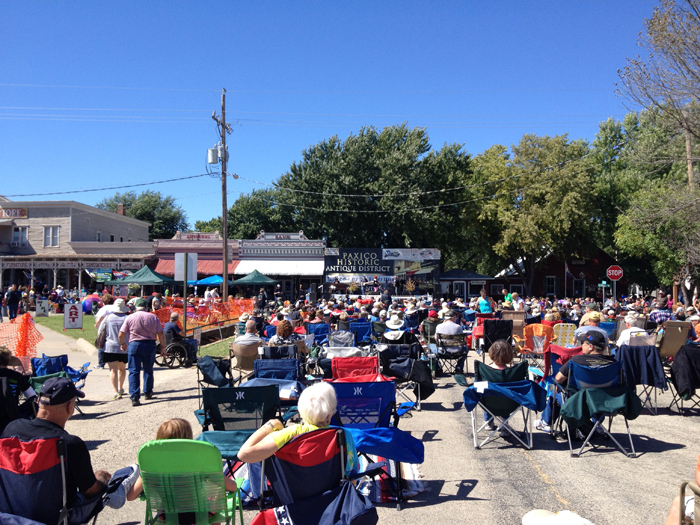 The Rachelle Coba Band entertained the festival goers through the middle of the day. As the sun started to cool off, the dance floor heated up in front of the stage. Cassie Taylor got the crowd moving before headliner Samantha Fish ended the night with a powerful set that had everyone dancing. If you&apos;re interested in attending next year&apos;s festival, be sure to check out their website as the event nears for additional information. Located just off Interstate 70 between Topeka and Manhattan, Paxico is a relatively quick drive from anywhere on the eastern side of the state. Within walking distance, the Mill Creek Campground offers camping spots for RVs, campers, tents, and even a few cabins for those wanting to spend the night. Bring lawn chairs and a cooler packed with your favorite drinks and snacks, but save room for the local food vendors, who serve up a variety of delicious eats. The festival has grown each year, so be sure to arrive early and don&apos;t forget your dancing shoes. Jimmy Sevcik is a writer living in Kansas City. A resident of the Sunflower State for most of his life, he&apos;s a big fan of Kansas City&apos;s professional sports teams and may never forgive his parents for leaving him with a babysitter while they attended the 1985 World Series. ("So what if I was only a year old, Mom?") In his free time, Jimmy enjoys camping, fishing and adventuring throughout the Midwest.